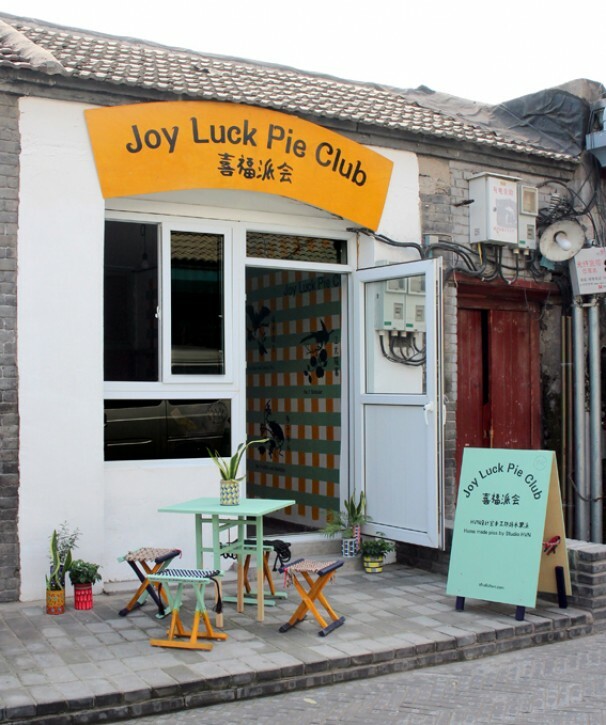 Situated on Yangmeizhu Xie Jie in the heart of Beijing’s historic district of Dashilar, “Joy Luck Pie Club” is a pie shop created by Studio Henny van Nistelrooy, serving home-made pies daily in a purpose-designed space only during Beijing Design Week (25 September- 3 October, 2014). The pies on the menu are all conceived and developed by the studio based on traditional Chinese motifs carrying good wishes. Historically used in textiles, wall decorations and furniture, these motifs are believed to bring success and well-being to one’s life. Through juxtaposing imagery of fruits and animals, they generate meanings. For example, the combination of a bat and peaches symbolizes good luck and health (bat is pronounced the same way as fortune in Mandarin, and peaches are the staple fruit for long life). Drawing inspirations on selected three motifs (rats and grapes for prosperity of future generation, a bat and peaches for fortune and long life, a magpie and three longan fruits for the highest scholarly achievement), three recipes employing seasonal fruits and special ingredients exclusive to Chinese food culture are designed—apple and raisin, peach and hawthorn, pear and dried longan. The very tasty and tasteful pies are served in an equally appetizing environment renewed by Studio Henny van Nistelrooy from an original Hutong outfit full of charms. Taking the graphic nature of the motifs and the classic pie top pattern, Studio Henny van Nistelrooy the studio presents the visitors with a delightful space to enjoy a slice of pie and refresh. Like the Hutong venue, the furniture is also renewed from a classic Beijing urban element, Mazha, a specific kind of folding stool that have been central to the inner city’s impromptu social gatherings through generations.